(Chinese Human Rights Defenders – October 7, 2013) – Two weeks before China undergoes a UN human rights review known as the Universal Periodic Review (UPR), Beijing police once again suppressed demonstrations demanding civil society’s role in national preparations for UPR. On October 3 and 4, police forcibly removed more than a dozen activists who had returned to demonstrate outside the Ministry of Foreign Affairs (MFA) in Beijing. This was the fourth instance, and perhaps the last, where police cleared this location in order to obstruct the sit-in since it began in mid-June. During interrogations, police told the activists that officials from “high level” have ordered them to detain each and every demonstrator at the site of the protest. On both the 3rd and 4th, police officers dragged off a dozen activists to a police station in Chaoyang District. From Beijing, Shanghai, and Xinjiang, among these demonstrators are: Chen Fengdong (陈凤东, female), Gao Yuqing (高玉清, female), Ma Jingxue (马景雪, female), Zhang Shuqin (张淑琴, female), Wang Yongcheng (王永成, male), Chen Baoliang (陈宝良, male), Xie Suihao (谢穗好, female), Gong Lingying (贡玲瑛, female), and Gao Weixin (高维新, male). On the 3rd, police drew the detainees’ blood (for the purpose of identifying them), and collected their fingerprints, and on both days police questioned the activists about the organizers of their demonstration. The police interrogated these activists in particular on the organizing role of activist Cao Shunli (曹顺利), who was abducted on September 14 (and remains disappeared) from Beijing Capital International Airport, and was thus blocked from attending a training on UN human rights mechanisms and the 24th session of the Human Rights Council in Geneva. Wang Yongcheng, one of the demonstrators, reportedly told police, “I have the right to request participation in drafting the ‘National Human Rights Report,’ the right to demand the MFA to disclose information related to the report, and most importantly, the right to file suit against MFA’s inaction. We share these demands with Ms. Cao, but [our sit-in] has nothing to do with her.” Police also used Cao’s reported “criminal detention” to intimidate demonstrators, although at this point Cao’s whereabouts remain unknown. Her relatives may have been threatened to keep silent, and as a result, it is unclear whether they have received official notice about her detention. After being questioned on October 3, the seized activists were sent to the temporary detention shelter at Jiujingzhuang and later released. But they returned to demonstrate in front of the MFA the next day, only to find policemen waiting to detain them. “The Human Rights Council and other states reviewing China during UPR must address the Chinese government’s aggressive acts of reprisals against human rights defenders, like Cao, who demand participation in UPR,” said Renee Xia, international director of CHRD. Since the end of 2008, Cao and other activists have demanded to have their voices heard in the government’s drafting of the national human rights report for the 2009 UPR and the National Human Rights Action Plan. They have submitted requests for public disclosure of information about “NGOs” and “experts” that the government has claimed to have consulted in the process. For their persistent advocacy, some of the leading activists have been intimidated, put under house arrest, or detained. Cao herself has been detained several times. Another activist, Peng Lanlan (彭兰岚), was detained for a year for “obstructing official business” after pushing for a civil society role in the UPR process, and was reportedly tortured by police. The MFA eventually responded in November 2012 by refusing the activists’ requests, stating in an official document that UPR materials and the preparation process involve “state secrets.” Following an administrative lawsuit filed by dozens of activists against the MFA, a Beijing court ruled in August (see PDF of Chinese ruling and English translation) that the ministry’s submission of a “National Human Rights Report” is a “diplomatic action,” which cannot be subjected to a suit waged by citizens (see previous CHRD reporting). Protesters have conducted a peaceful sit-in outside of the MFA since mid-June 2013. 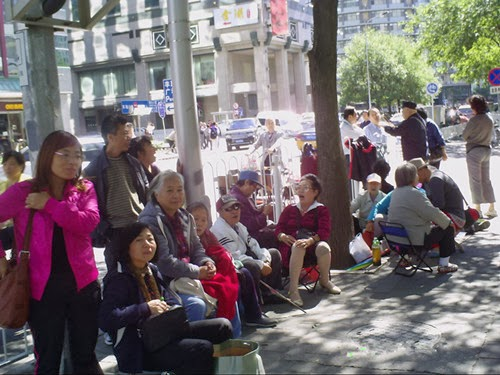 At one point, around 200 participants took part before Beijing police forcibly cleared them away. “Local Authority Gathering Concocted Materials, Protesters at Ministry of Foreign Affairs Are Collectively Arrested Today” (当局收集整人黑材料，外交部坚守者今被集体抓派出所), October 3, 2013, HRCC; “Human Rights Defenders Relay to MFA for Response Are Cleared Away” (维权人士接力到外交部等待答复被清理http://wqw2010.blogspot.com/2013/10/blog-post_9549.html?spref=tw), October 5, 2013, WQW.